Mr. Tim Schmidt, Senior Technology Advisor at FHWA-TFHRC, U.S. Department of Transportation (U.S. DOT), will deliver a keynote “How Talking Cars Will Transform the Way We Travel” at COM. * 2014 conference which will be held on August 4-6, 2014, Washington, DC. Imagine a transportation system where cars can see things that you can’t. Such cars could warn of a potential crash or icy roads ahead, advise of a traffic jam ahead, or help find a parking space. Imagine if buses could tell if you will make your next connection, mapping software could indicate the greenest travel route, and cell phones could communicate with traffic signals so disabled pedestrians can safely cross an intersection. 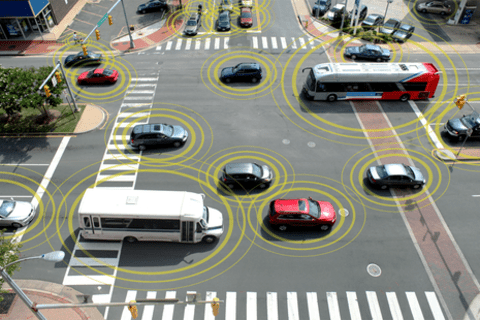 These developments are closer than you think through the U.S. Department Transportation (USDOT) connected vehicle research. Connected vehicles combine leading-edge technologies (GPS, Wi-Fi, wireless sensors, and dedicated short-range communications) to enable high-speed, real-time communications among vehicles, roadside infrastructure, and mobile devices. The USDOT is investing in connected vehicles because of their promise to save lives, as well as improve traffic flow, reduce environmental impacts, and make our communities safer and more livable. Mr. Tim Schmidt has served the U.S. Department of Transportation in multiple senior executive capacities involving technology advocacy, strategic planning and thought leadership, and has been involved with various aspects of connected and automated vehicle activities. His keynote will outline various aspects of the federal government’s vision and potential roadmap for self-driving cars. Mr. Schmidt is currently the Senior Technology Advisor at FHWA’s Turner-Fairbank Highway Research Center. He was formerly the U.S. DOT’s Deputy Chief Information Officer (CIO) and Chief Technology Officer (CTO). He has also held technology and corporate leadership positions at the FAA, IRS, White House and multiple private sector corporations. Mr. Schmidt is a retired Army officer having served over 20 years within the U.S. Department of Defense. The Hot Short Talks session (each talk with 10-minute presentation and Q&A) is an opportunity for presenting your hot products, late-breaking results, ongoing projects, speculative or innovative work in progress, application or case studies, development techniques, and technical services. Furthermore, this session does provide the extra opportunities specially for start-ups, exhibitors, vendors, consultants as well as potential billionaires, innovators, and so on. Poster is an option of the talk. The Demo Videos session is intended to showcase innovative geospatial computing related implementations and technologies. It is also intended to provide speakers and participants with the ability to network with each other and to engage in technical discussions about the work. COM. * 2014 has expanded to three more emerging tech areas, Big Data, driverless cars, and geospatial computing. COM.Geo has been playing a guiding role to advancing the technologies in computing for geospatial research and application since it was initiated 5 years ago. This year, COM. * conferences and summits will focus on COM.BigData 2014, COM.DriverelessCar 2014, and COM.Geo 2014. All three will take place in the same time frame and conference center in August in Washington DC, USA as well as COM. * online Virtual Conference center. Several leading keynotes and insightful panels from U.S. federal government and world-class industries and universities will be open to all the attendees of the three conferences and summits. There will be a great opportunity for everyone to learn trends, share visions, exchange ideas, discuss details, and expand networking circles.